Conkies, a corn base Barbadian delicacy, are traditionally made during the month of November, celebrating independence (Nov 30th). Conkies were originally made to commemorate the old British colonial celebration of Guy Fawkes Day (Nov 5th). This is a laborious recipe, but the results are worth it. *Leaves can be substituted all together with wax paper or foil paper; however, your conkies won't taste as good. Banana leaves are used to wrap the conkie mixture, therefore you need leaves that aren't shredded. Strip leaves from stalk with a sharp knife. Leaves are very delicate and tear easily. To use them in your recipe, you must make them pliable by briefly singeing them over an open flame. If your leaves start to curl up, that means you had them on the flame too long. If your leaves spontaneously combust, that means you were using old, dried up leaves. Please use green leaves! Tear your singed leaves into individual squares to wrap your conkies in. Many recipes recommend 8" x 8" squares, but they can be bigger depending on how big you want your conkies to be. Cut the leaves into pieces that you can comfortably wrap the conkies in. 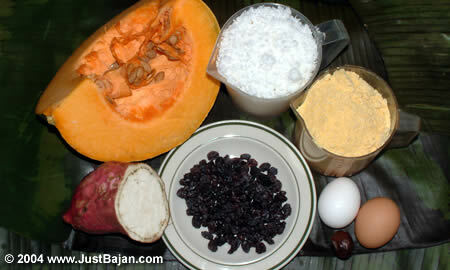  Combine grated coconut, sweet potato & pumpkin.  Mix in sugar, spices, flour, corn flour, salt and raisins.  Add milk, margarine and almond essence.  Mix ingredients well. Mixture should be thick and drop slowly from a spoon. 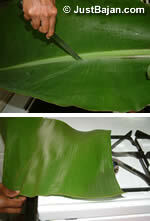  Place 2 to 3 heaping tablespoons in the centre of each banana leaf square.  Fold the banana leaf neatly around the mixture. Be careful not to tear the leaf, else the mixture will leak. Steam conkies over rack of boiling water in a large saucepan or steamer until firm to the touch. The video below shows how to fold the banana leaves.